Marylandmotocross.com: Hello Larry, this is Scooter, can I speak to Devon please. Mr. Pilkington: Sure. Who’s this I’m sorry. MM.com: My name is Mike, from Marylandmotocross.com, I’d like to interview your son if possible. Mr. Pilkington: Oh yeah. No problem. Hold on onnnnnnnne second. MM.com: Hey Dev-on should I call you at home? DP: Aww yeah, cause right now we’re about to go out to eat, do you have my phone number? MM.com: Yea, what time do you think you’d be home? DP: What time will we be home dad? Mr. Pilkington: In about an hour. DP: An hour or so. MM.com. Okay, if you’re not home in an hour I’m gonna stab you in the face with a soldering iron. MM.com: Yeah, can I speak to Devon please? Nice Person: Sure, one second. Devon! Huh? I dunno, someone needs to speak to you. MM.com: Do you turn when you do a No-Footer? Kevin Duffy (Hit’s me with frying pan) Blickkk-up. His Picture man. Turn or No-Footer. MM.com: Owww! Okay! Umm…Would you rather see your picture with a turn or a No-Footer? MM.com: A left turn or a right turn? DP: A leaning, down, right. MM.com: Okay, so what did you eat for dinner? DP: What did I eat? DP: We went to Golden Corral and there was nobody in there, but I only had something little, cause I ate a couple candy bars too. MM.com: Oooh. Mike like candy bars. 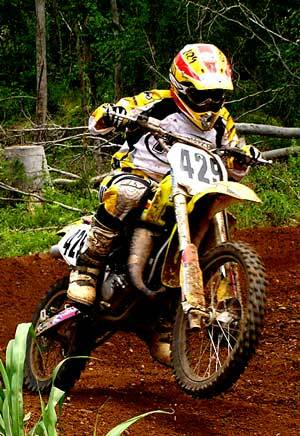 So, how old are you and how long have you been doing motocross? 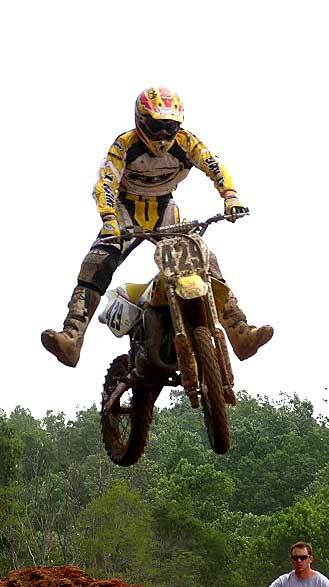 DP: I’m fourteen years old and I’ve been doing motocross for nine years now. MM.com: Is there anything you like or dislike about it? DP: I like winning and stuff that leads to it (laugh) cause it feels good and I dislike the ups and downs that come with your chain breaking or something stupid like that, especially when you’re doing good. MM.com: Piece of advice; stop breaking your chain. DP: (Laughing) Oh yeah. I’ll try. MM.com: So what do you like to do in your spare time when you’re not racing? DP: I like to play paintball whenever I get the chance and just hanging around the house and talking to people on the computer. MM.com: Something like that. Do you have any plans on turning Pro? DP: Yeah. This year I’ve been practicing like…really, really hard. I’ve been training. I’ve got a trainer now that I work out with on Wednesdays and Fridays and I’ve been riding almost every day. I’d like to try to turn Pro by sixteen. MM.com: That’s pretty kewl. I guess you got a lot of work ahead of you. DP: I do. I do. MM.com: What kind of bike do you ride and what kind of gear do you use? 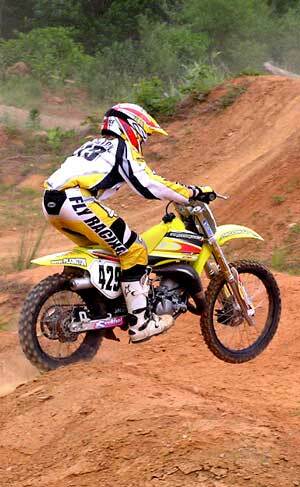 DP: Right now I’m riding an 2004, 85 RM and I wear Fly gear. MM.com: You recently were in that movie “Torque” in which you look a lot older, right? DP: (Laughing) I wish I was in a Hollywood Movie, No the movie I’m in is called Motovation. MM.com: So, how do you feel about people saying you’re the guy to beat at some events? DP: Umm, it puts a lot of pressure on you, you get on the line, you see everyone giving you the thumbs up, and stuff like that, and you know you have all this pressure to win, sometimes it feels pretty cool, having kids walk up to you and say “You’re fast man, can I have your autograph?” but the pressure really gets to you sometimes. MM.com: What’s your favorite track or event to go to? DP: Every year, what I go for every year is Loretta’s. That’s where all my focus goes to. It’s all about “Okay Devon, we’re going to race this race with these fast kids so we can get ready for Loretta’s,” and as soon as I get back form Loretta’s it starts all over again. MM.com: Pretty much everyone there is fast, huh? DP: Yeah, so we try to make it every year. I’ve been fortunate enough to make it the last 8 years in a row now. It’s been really awesome going there cause that’s where I get most of my sponsors. MM.com: Do you have any bizarre training methods or rituals that you think is unique. DP: No, not really, I’m just like a normal kid, per say (laugh). MM.com: If you could use one word to describe yourself on the track what would it be? MM.com: I told you you can’t use that word! DP: (Laughing hard) I…haha…..know. (Laughing harder) Ohhhhh maaaannn. Never giving up. That’s three words though. MM.com: Don’t worry we can hyphenate it to make it one word. DP: (Laugh) All right. It’s because one race I was in 42nd, I crashed and then I got back up and pushed my way back to 7th. MM.com: So what’s this I hear about you trying to go to the war? DP: (Laughing) Heh-heh. Over in Iraq. MM.com: Yeah with Captain M.
DP: Captain M, who’s Captain M? DP: (Contemplative) Captain M? Ohhhh McGrath? MM.com: No! Captain M makes him look like a chump. MM.com: Man, you need to…you know what you need to do… you need to…you’re, you’re… Man you know what, I’m just gonna change the subject. MM.com: So what do you think of Kevin Duffy? DP: Oh Kevin with the Converse on? DP: And the black socks, he’s nice. MM.com: He thinks you’re pretty fast. Any advice for anyone new to the sport? DP: Just never give up, always try your hardest. You gotta be dedicated if you want to be good, you have to to be dedicated. Like a couple days ago, I didn’t want to ride, but I knew that I had to. MM.com: Anything that you feel cautious about in racing. DP: When it’s real slick out and they water the track too much, you know there’s like a 70% chance of you going down and you need to avoid that if you want to win. The regionals are the worst time for that to happen. It feels like you gotta do good on every motto there. MM.com: Well, we thank you for you time and we look forward to seeing you at the front of the pack at Loretta’s.